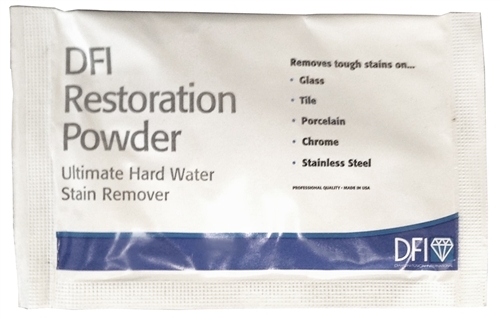 DFI's RESTORATION POWDER removes stains created by hard water and other pollutants on windows, shower doors, skylights, tile, porcelain, stainless steel fixtures, and so much more. The Powder is an important step in properly preparing surfaces to be treated with a Diamon-Fusion® protective coating. Each packet contains 7g. (grams) of Restoration Powder. Restoration Powder 5oz Revitalizer 4oz Stainless Steel Defender™ 500ml Bottle (16.9oz) Nylon "Light Scrubber"
Items were delivered in a reasonable time.. Disappointed at the size of the packets.. I guess I should have researched more.. considering the delivery price I really wish I had ordered a larger amount..